I just haven’t been able to upload photos. But, as a friend said, chin up and feet forward! The days go on and we’ve been having so many adventures. 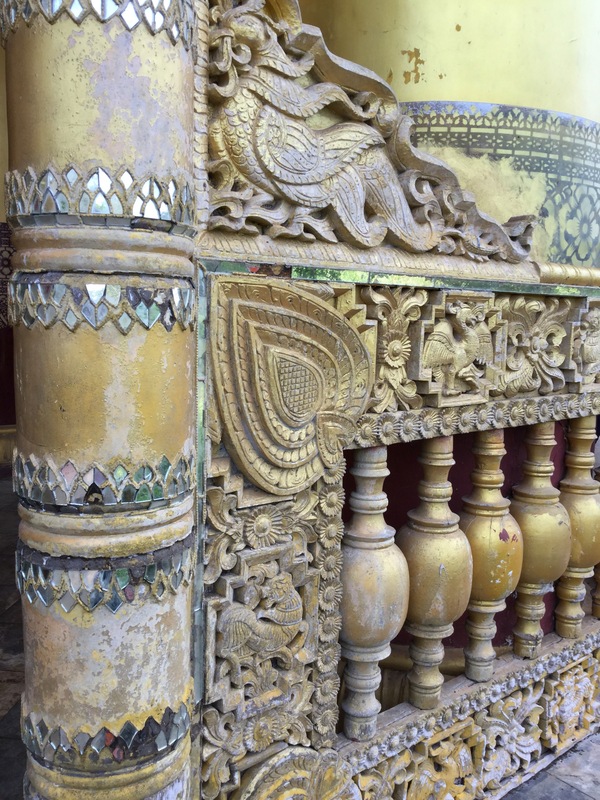 We have been in India over 2 weeks and I keep writing, so I wanted to post even though photos will have to be loaded later. 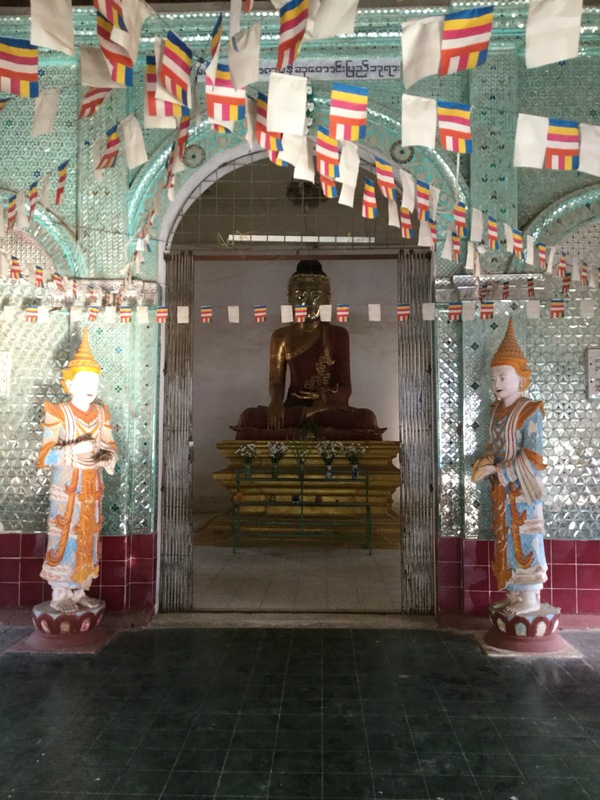 After all night on the train bench, we staggered into Mandalay from the train station and, hoping for the best, asked a taxi driver to take us to one of the hotels we had on our list. 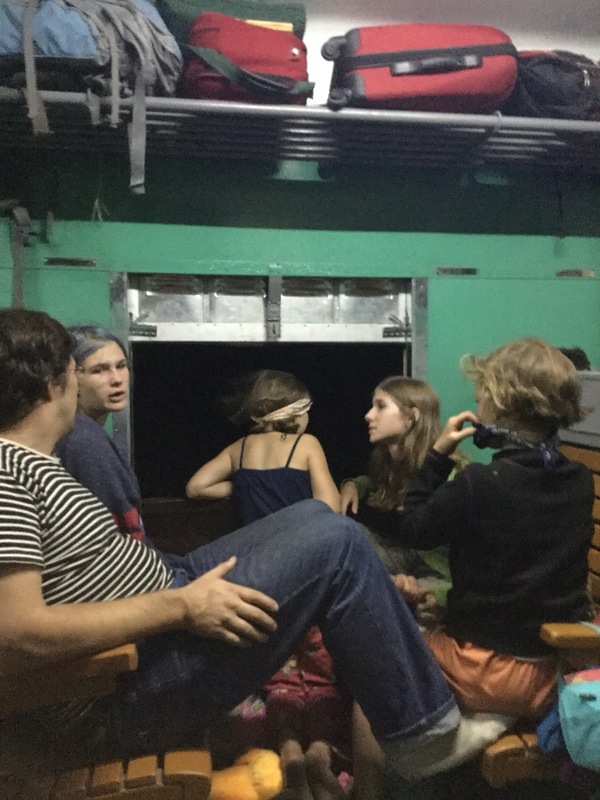 We found ourselves in the back of a truck-like taxi with all of our luggage, bumping along dusty, busy roads crowded with cars and motorbikes. Motorbikes! Those sneaky between-the-lane vehicles that made crossing the street treacherous in Bangkok but had been pleasantly absent in Yangon. 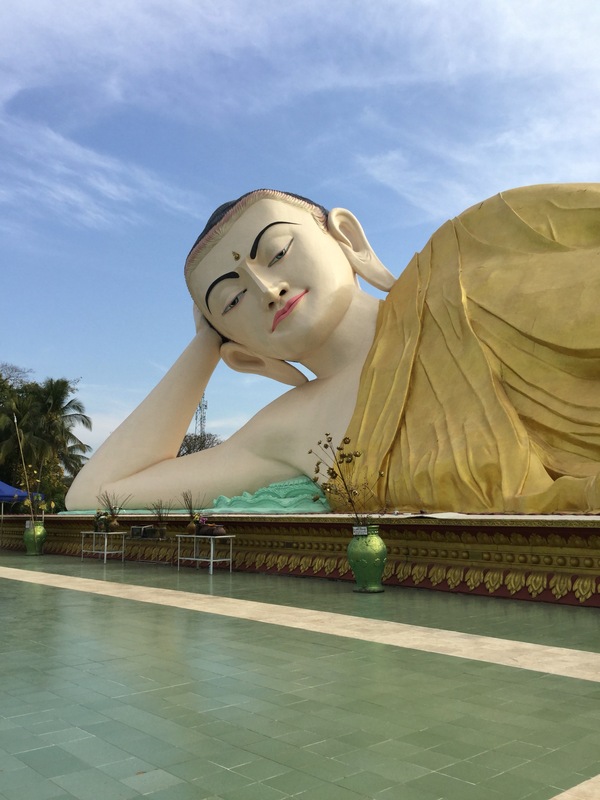 Happily no one was hurt, but a motorbike was to shape our Mandalay experience for the worse. The hotel was fine, and I for one took a nap. Later, I noticed our room was actually quite nice with large windows and a little balcony. Breakfast was included, which seems standard in Myanmar, and this one was really good- sweet milk tea, fruit, eggs, toast and homemade donuts! They actually gave us breakfast that first day, since we were there so early, in addition to letting us check in early and sleep 6 in a 3-bed room. So, a great hotel for us! 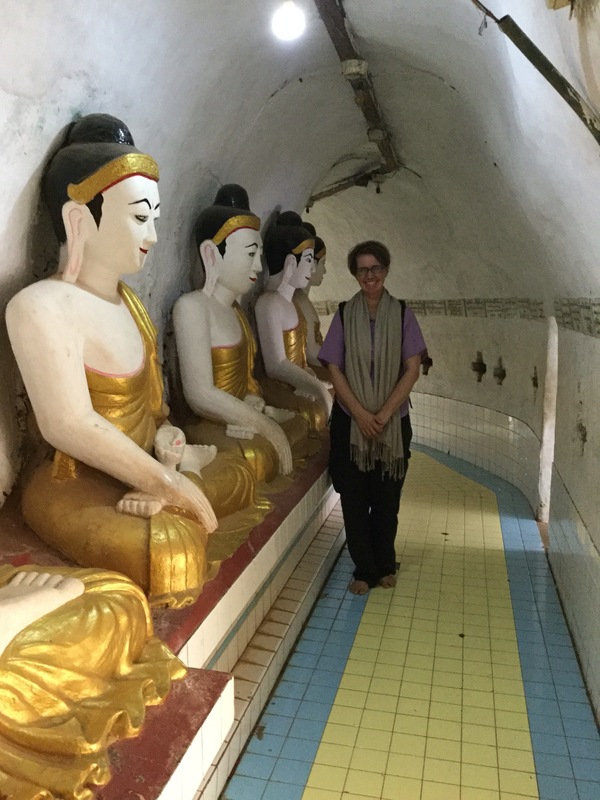 Later, we walked around the area and found that we were in a warren of dust and rock streets, near a large vegetable market and a temple called Eindawya. 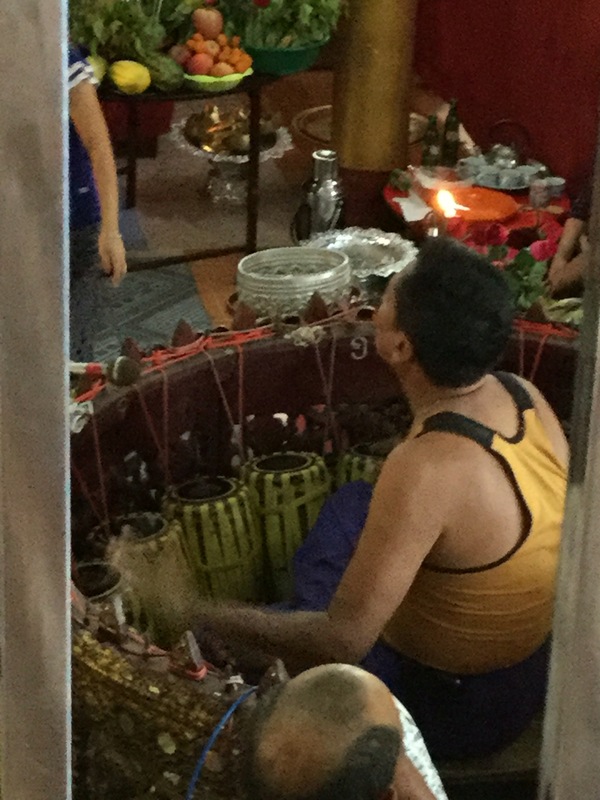 In the mornings we saw monks in crimson robes, unlike the Thai orange-robed monks. Also unlike Thailand, we saw many female monks. They wear pink and white and we often heard them singing as they went alms collecting. There was a small school in a traditional wooden building across the street, and the kids were invited to class. There were local kids everywhere, plus a few at the hotel, so our kids enjoyed the neighborhood. We walked to the paved streets in the downtown area and found a simple Indian restaurant and a nearby ice cream shop and had a great dinner. Our next few days we did a little sight seeing. We went to a restaurant on the river that has traditional puppet shows. 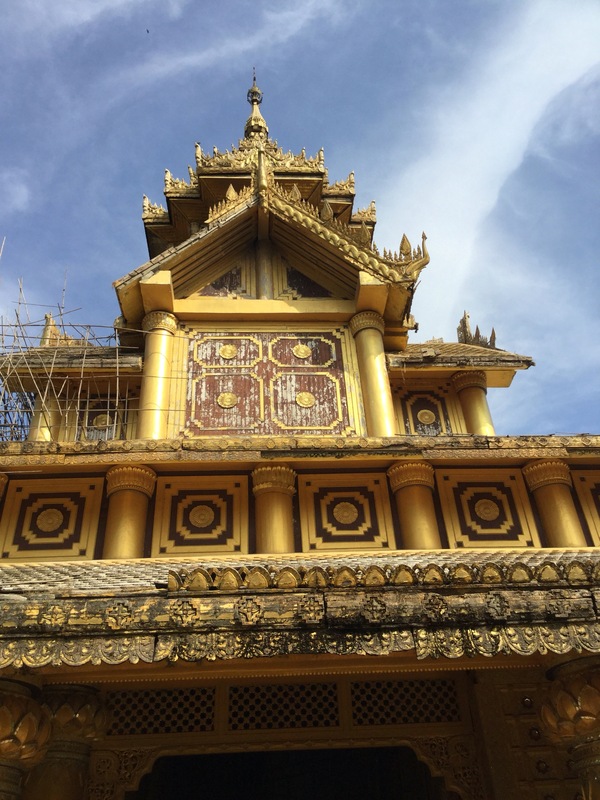 We had a taxi tour to a temple with domesticated stag deer and later to the gold pounding part of town. 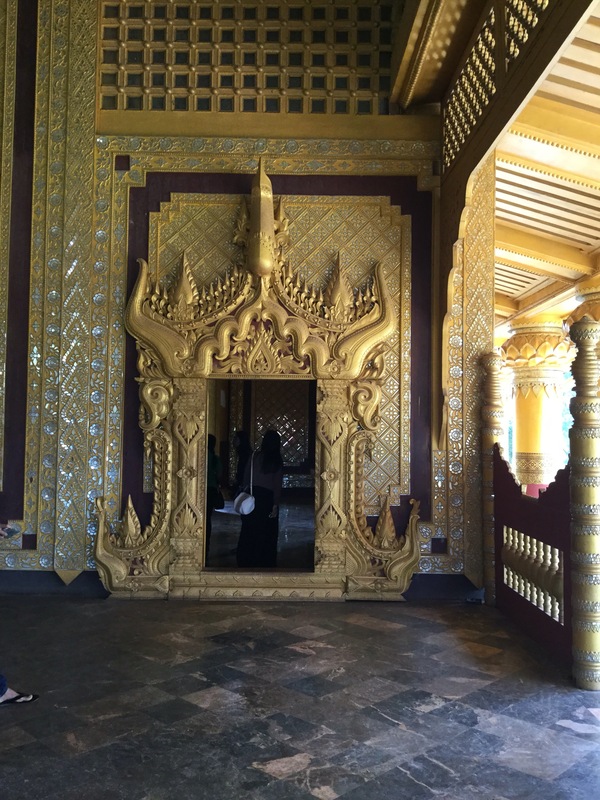 The stag temple had a lovely temple grounds which included a golden cave shrine and a stag with large horns. The kids fed the stag, as did many visitors. 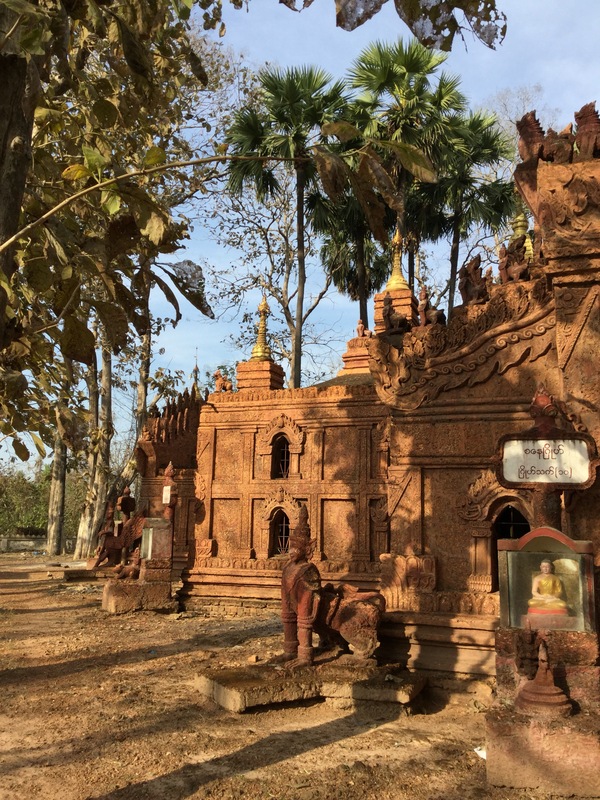 Like many temples we have seen, it had several staircases to access the top and also it functions as a small community with houses, people cooking and doing laundry, with all of this surrounded by fantastical painted statues and people bowing and praying. 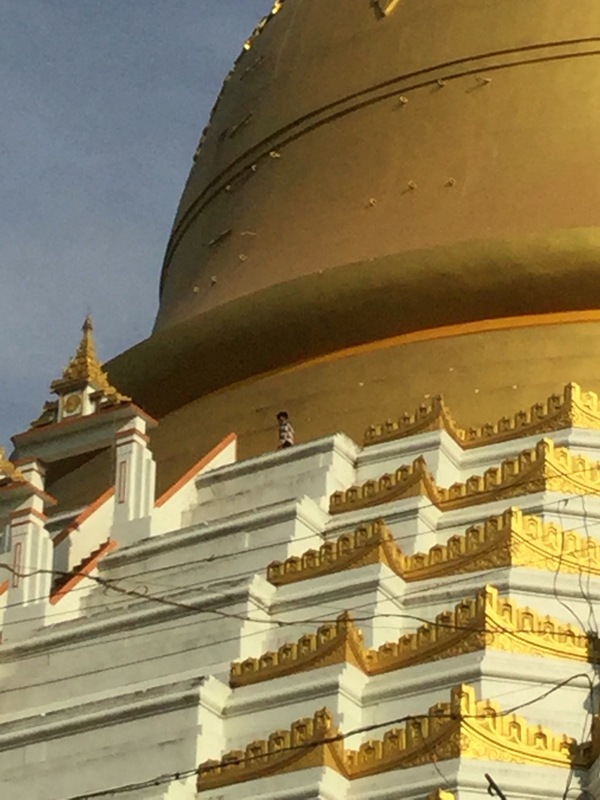 I am always amazed by the mixing of sacred and ordinary- everywhere in Asia there are monks walking around towns and people having a picnic lunch near the Buddha statues in temples. It is so different from my experience growing up Catholic and having distinct spheres of church and then separately, the rest of life. Back in town, the gold pounder area featured men wielding large hammers and flattening pieces of gold into a thin foil, which is gold leaf. This takes several rounds of pounding, the last of which takes five hours! 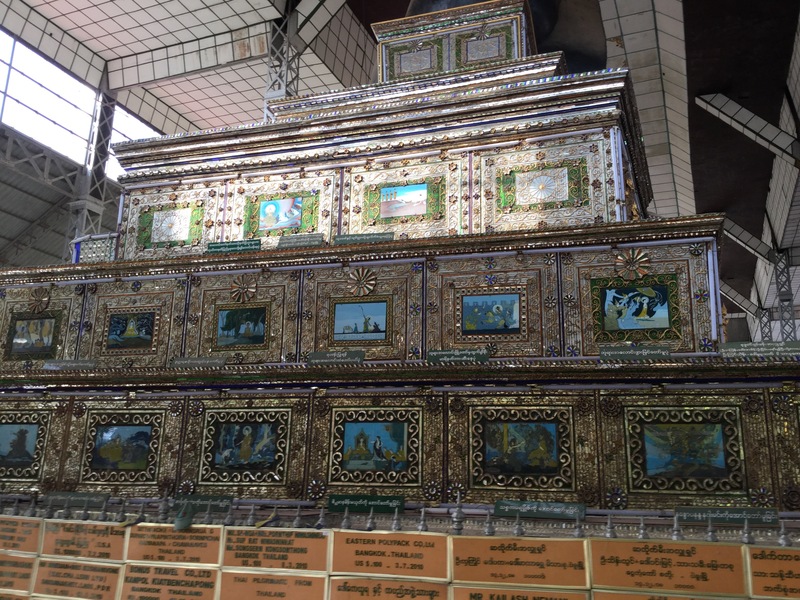 The foils are sold and used by Buddhists to decorate Buddha statues at shrines. We visited one where this was taking place. The Buddha there had about six inches of the gold leaf everywhere except the face, which we read is ritually polished every day at 4am. 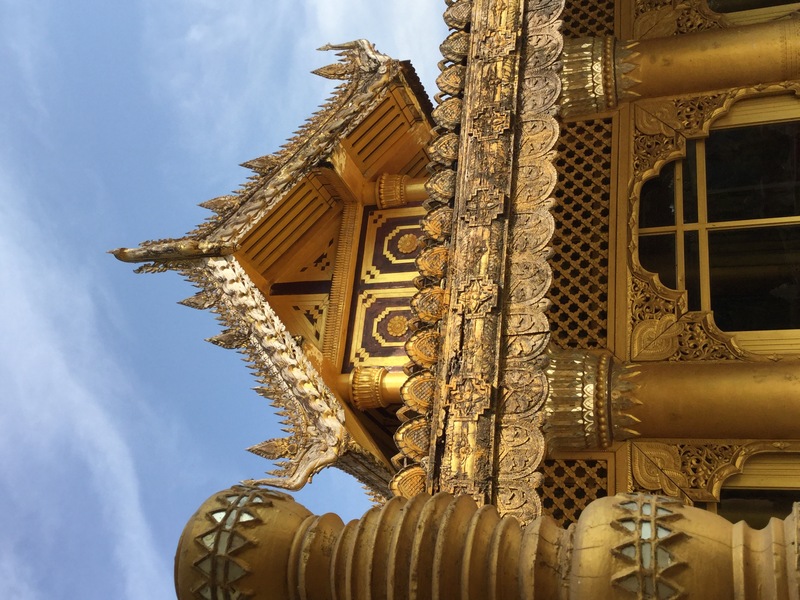 Only men were allowed to place the gold leaf on the Buddha, as women watched outside a gate and on video screens. 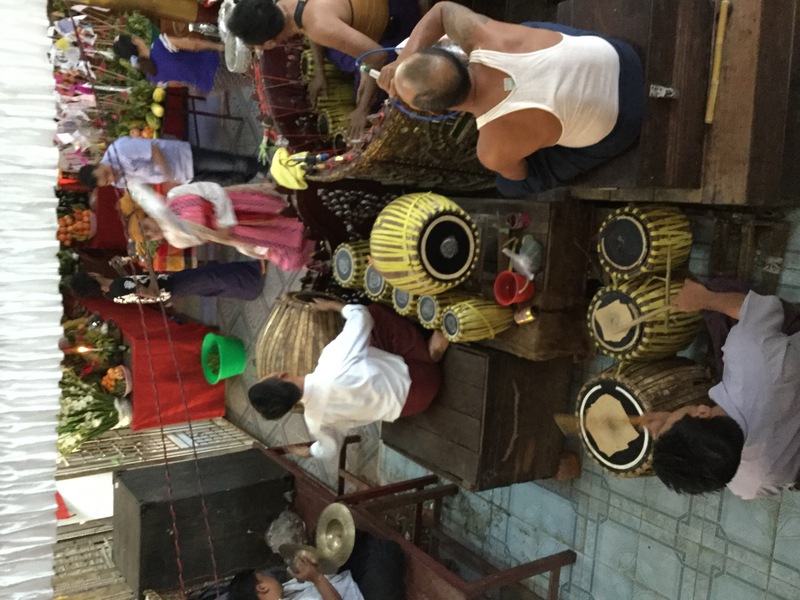 The place was packed with Buddhists taking part in the activity. Mr. Fantastic and I rented a motorbike one day and saw a few temples. 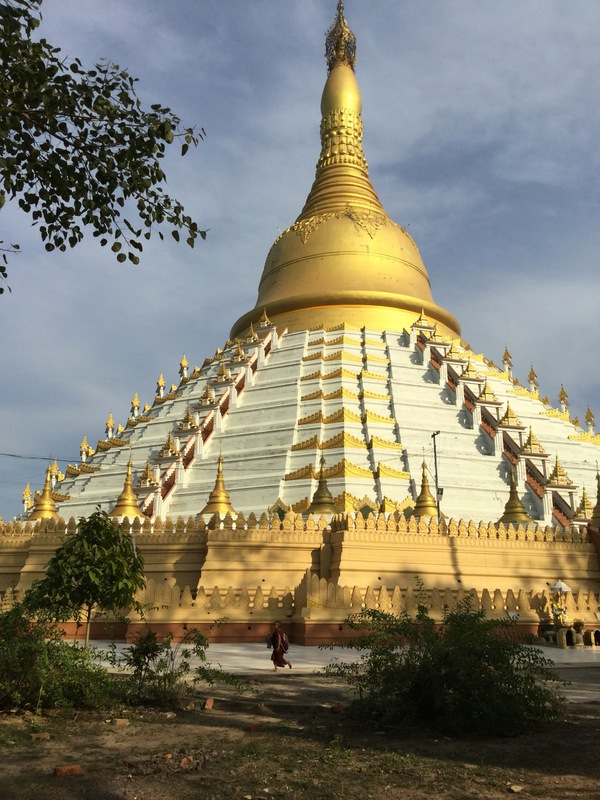 We saw a replica of the famous golden rock shrine (Kyaiktiyo pagoda). 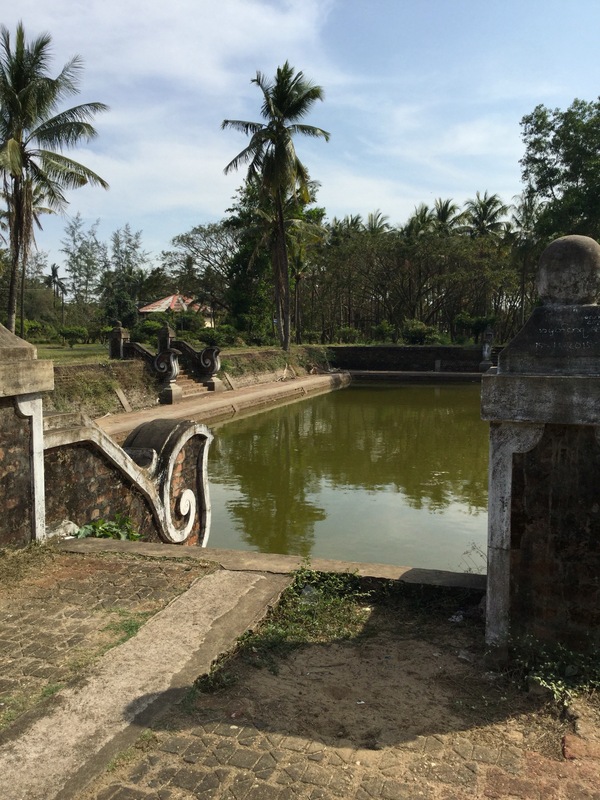 We rode near the walled palace and out towards a famous wooden bridge, but didn’t make it to the bridge. This ride had started out well but took a turn for the worse when the motorbike was stolen! 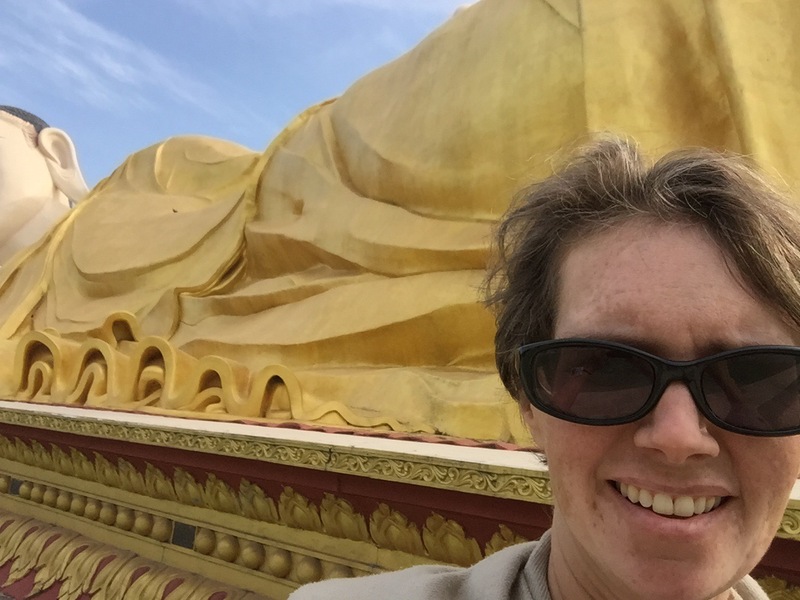 We spent several hours with a crowd of monks (it was stolen at a temple), the owner, and two types of police (tourist police and city police). We went to the police station where uniformed officers apologized for their countrymen and served us tea. There was a long conversation between the police and the owner; I think they were discussing the need for us to be present at a trial. 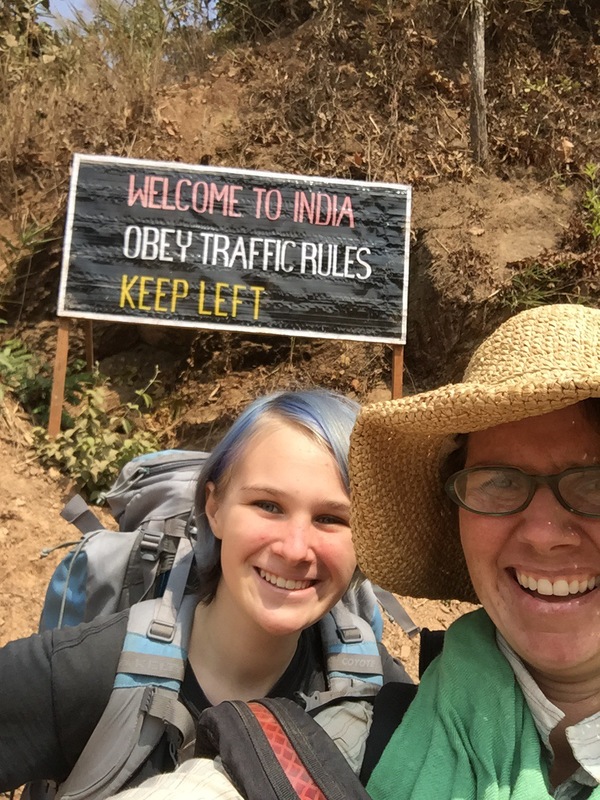 We had time constraints of crossing the border to India on a specific day, so we couldn’t stay too long. We ended up paying about $450 to the owner- could have been worse but what a budget killer for us!- to replace the bike. It had partly been our fault since we had left the keys in the ignition. But come on! 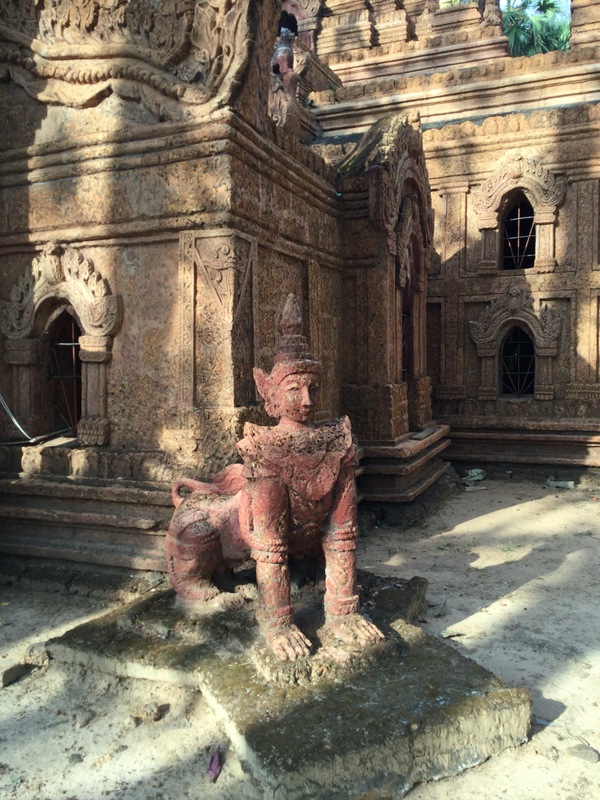 It had been inside temple gates, and was left for only 15 minutes before we realized we had left the keys. 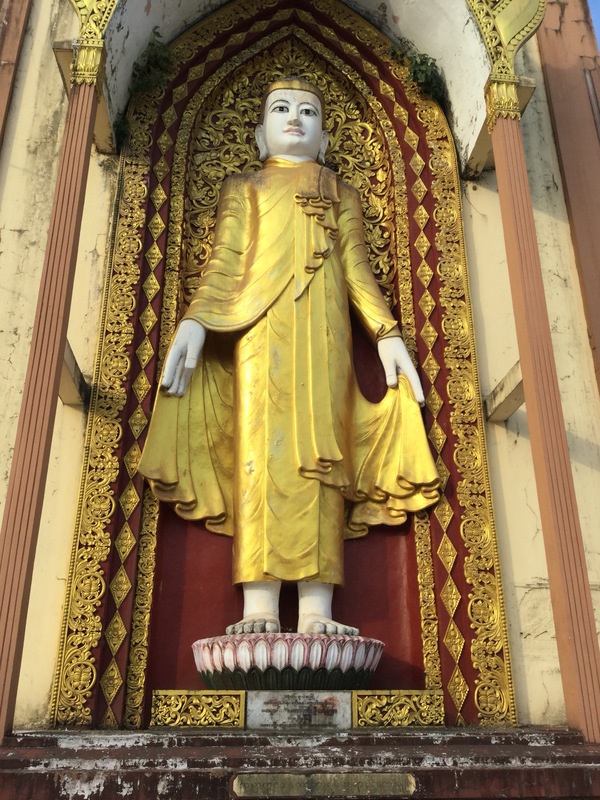 Unfortunately, for us, Mandalay will always be tied to that event, though the city really was nice and the people and food and sights really were great. 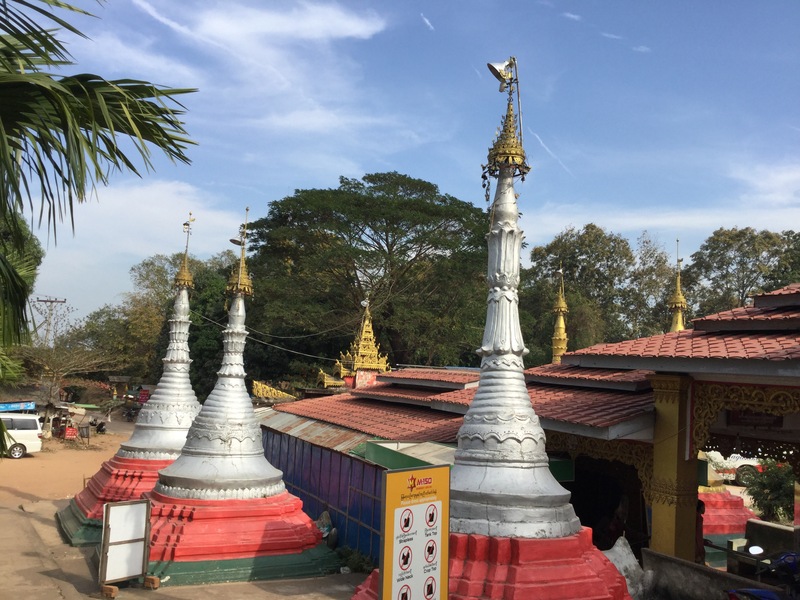 We were ready to continue towards Tamu and the Indian border, so we headed north to Monywa. 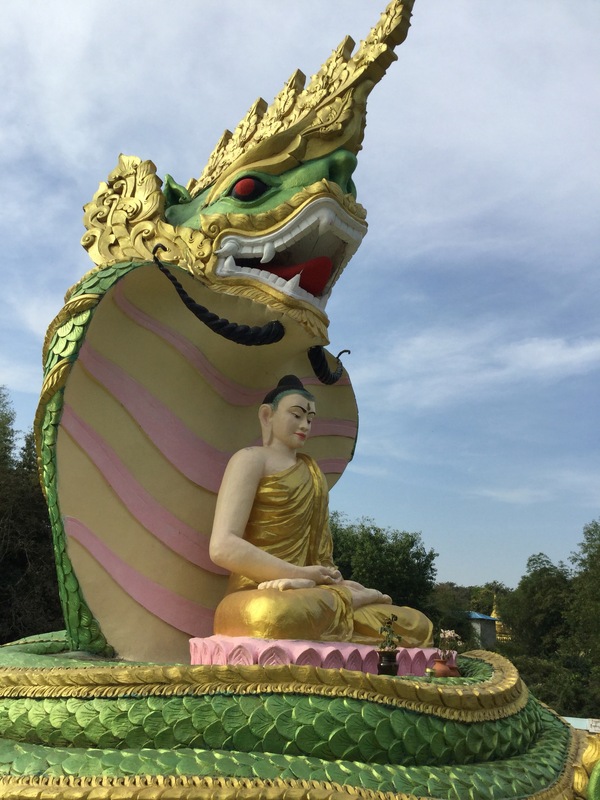 After the palace, we went to Kyaik Pun, home of the four massive seated Buddhas, one facing each direction. 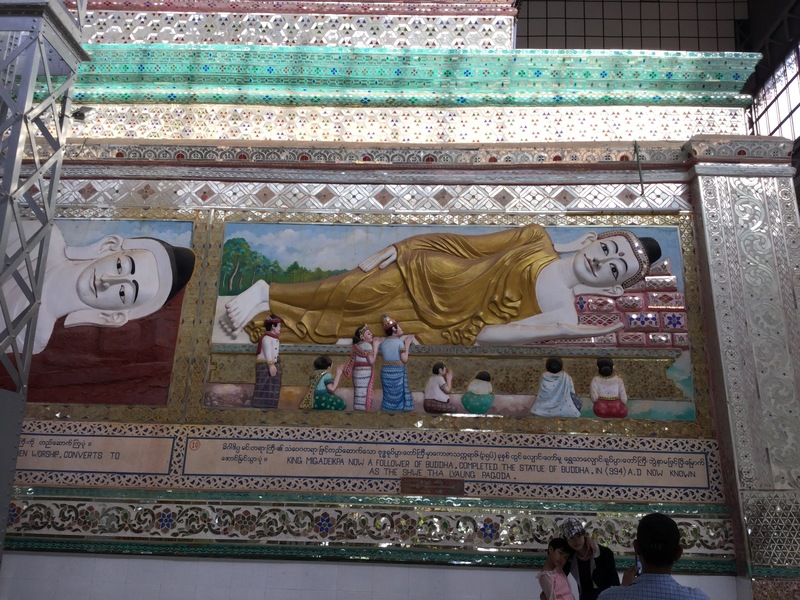 Next, we saw a reclining Buddha, right now I can’t find the name of this one. 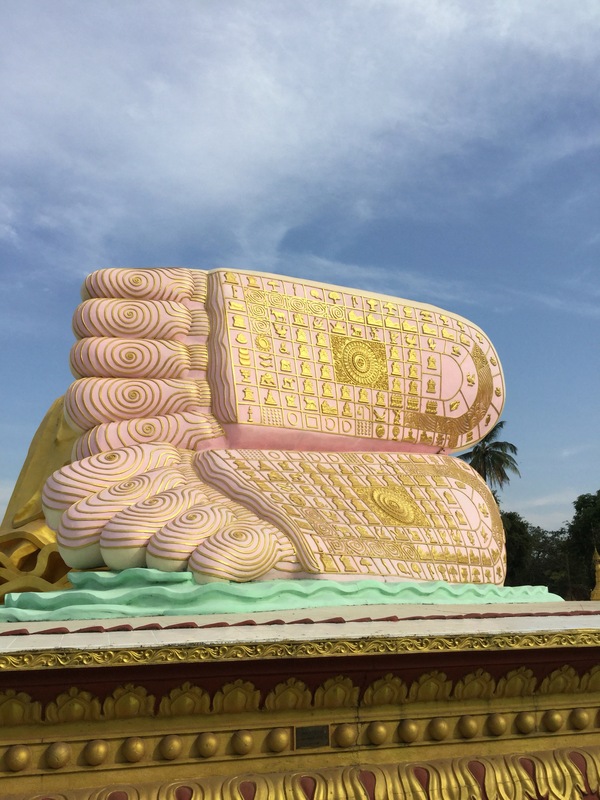 Then another reclining Buddha! 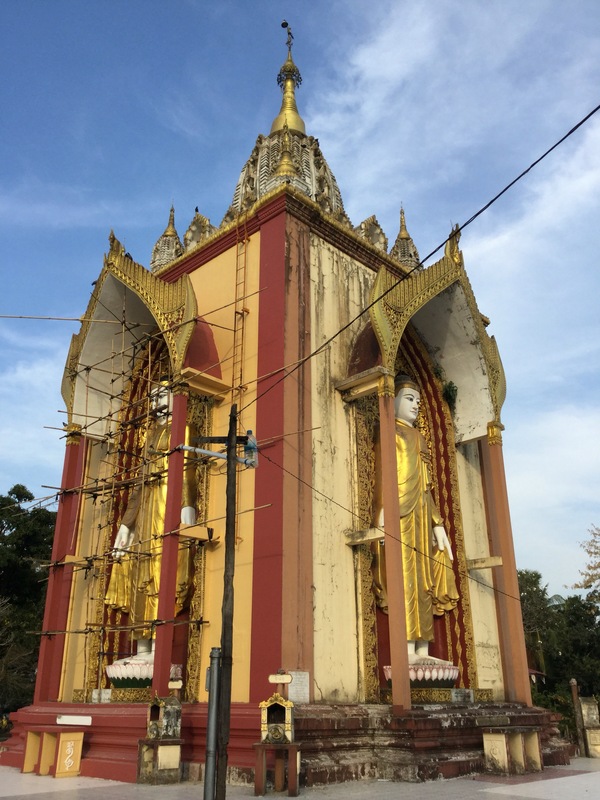 Shwethalyuang Buddha is housed in a building of sorts. It had the story of its construction told in carvings along one side. 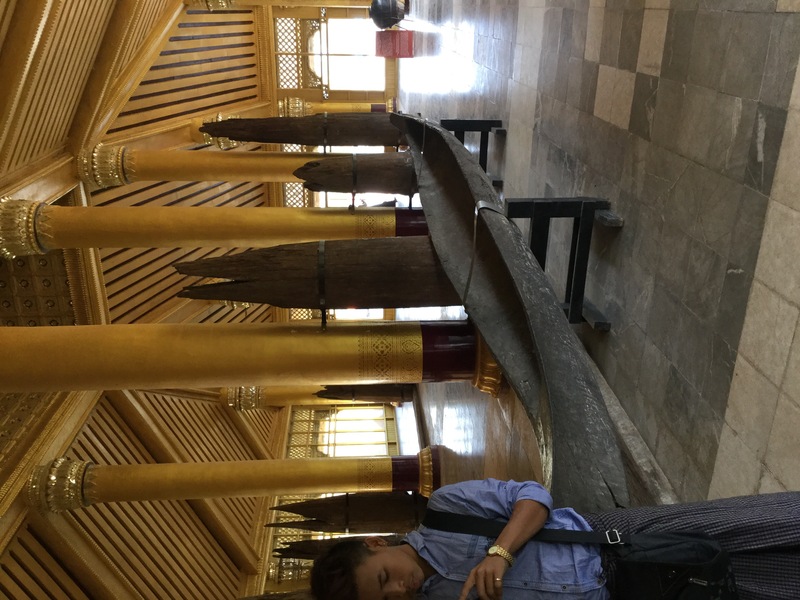 Next was the massive Mahazedi Pagoda. Note the size of the man in the close up to get some perspective on the size of this structure. I as a female was not permitted to go up there, by the way. 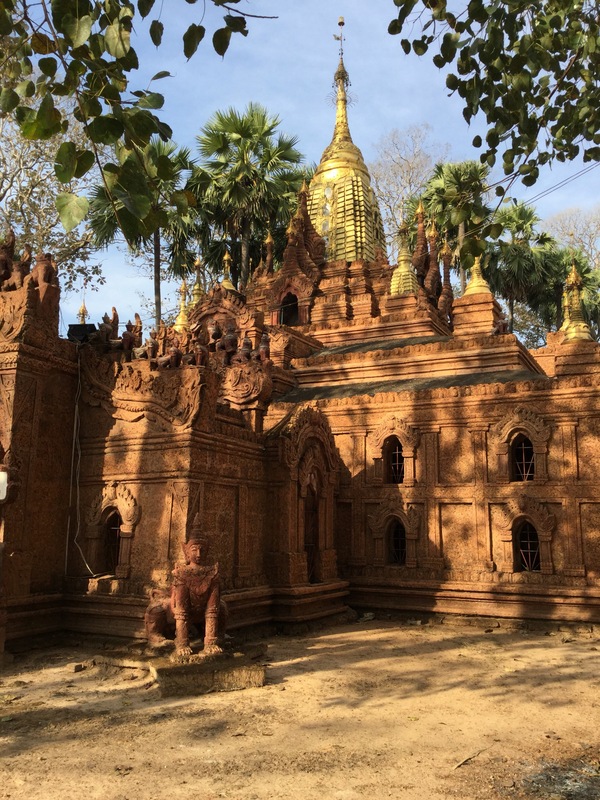 My favorite thing here was a temple ruin that truly looked like a ruin. It was off to the side, had a gorgeous crimson color in the afternoon light, and was free of gender discrimination. No access inside, unfortunately. It was a nice exemption to the usual restoration of temples here. 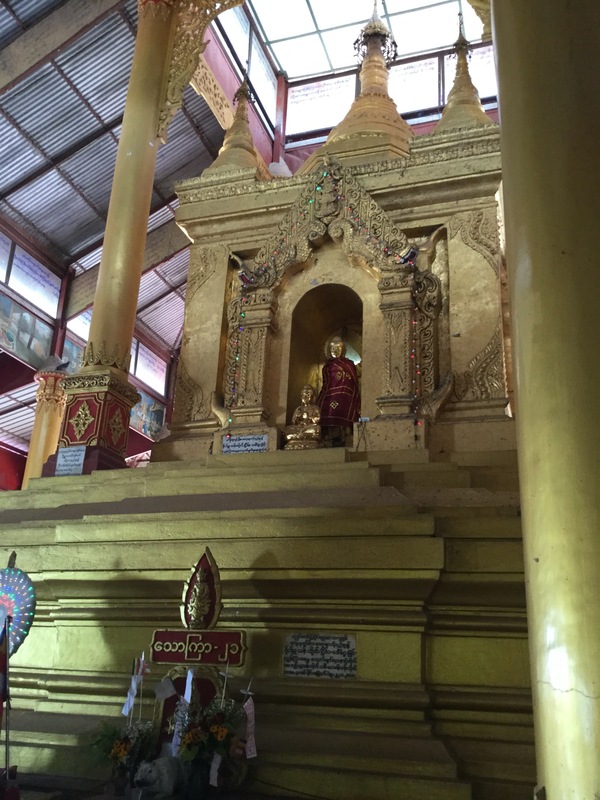 The next stop, according to my guide, is an ancient and important Paya. 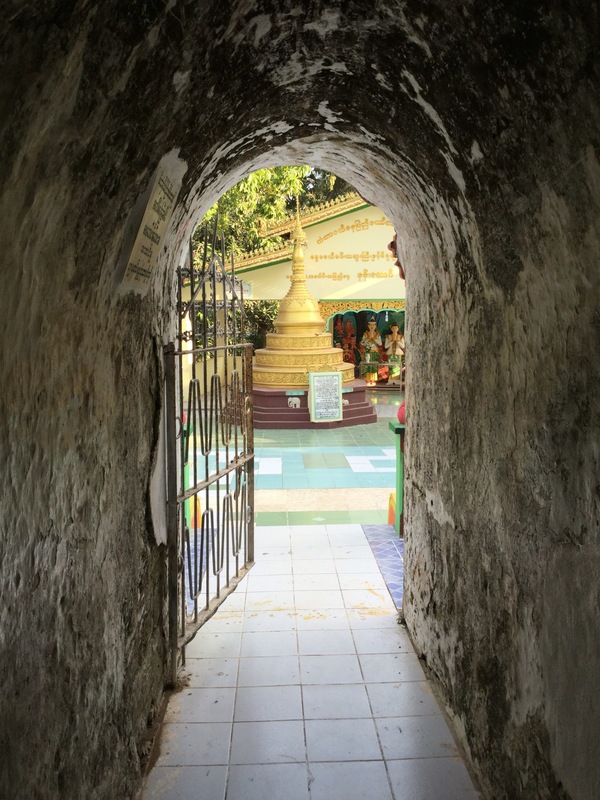 It is a circular hallway inside the Paya lined with seated Buddhas. He wanted to take my picture there, so here it is. We went to a few more temples before calling it a day. I didn’t get the names, but the last one seemed to be an active monastery and my guide asked me not to take pictures after I had taken a few. 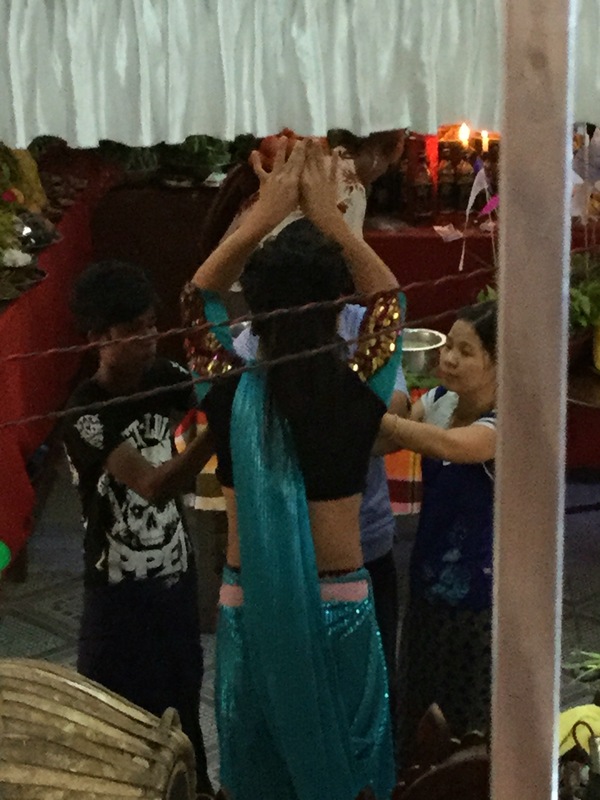 He then tidied his hair and longyi (the skirt-like garment worn by Myanmar men) and solemnly bowed several times to a monk who seemed to have appeared out of nowhere. Here are some photos of the last stop of the day. Overnighted in Gawahati (Assam state) India, then took train to (West Bengal) Siliguri, one night there then 3 hr uphill shared jeep taxi to Darjeeling where we arrived yesterday and plan to spend 4-5 days. It is beautiful and cold in the misty mountains here! 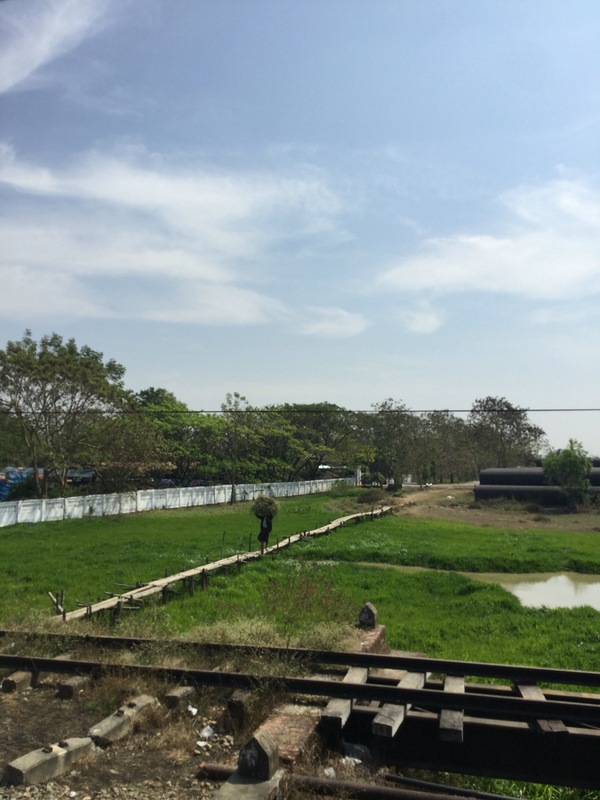 Update: we spent about a week in Darjeeling, then 1 night in Kurseong on the way down the mountains, took a 30-hr train from New Jalpaiguri to Dehli. Planning a week in northern India with friends who fly out next week, still trouble uploading pics, bye for now! Update 7 March: we are spending a week with friends- Dehli, Agra, Jaipur. Still can’t get photos to upload! 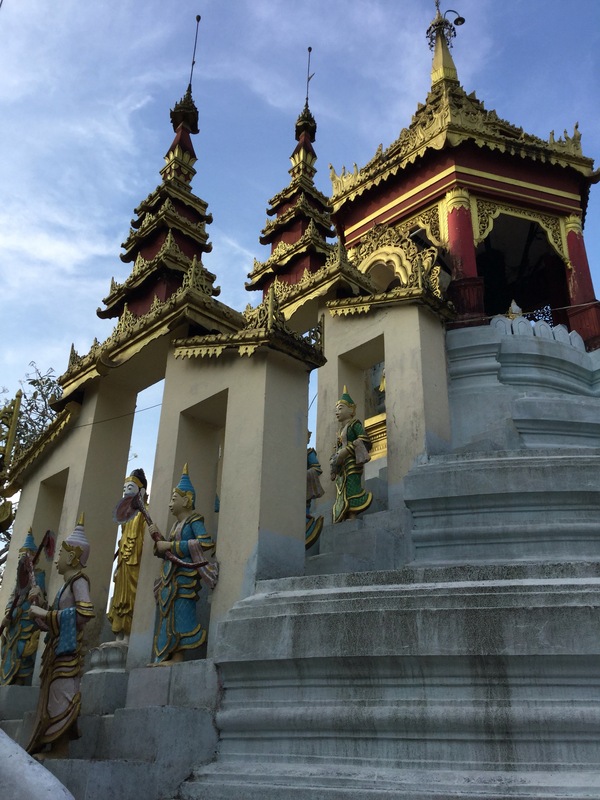 The kids and DH were happy to stay in Yangon while I took a solo day trip to Bago. 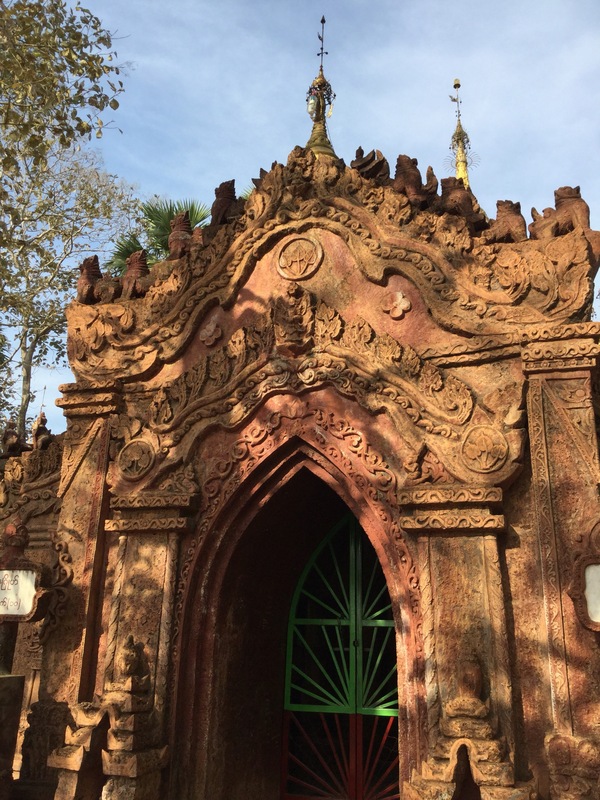 I could not persuade anyone to take the two- hour train ride and see temples in one of the former capitals of southern Myanmar, so off I went! The ride went quickly and I loved looking out the window. When the train arrived, I began looking to rent a bike, since I had read that it was a bikable town. 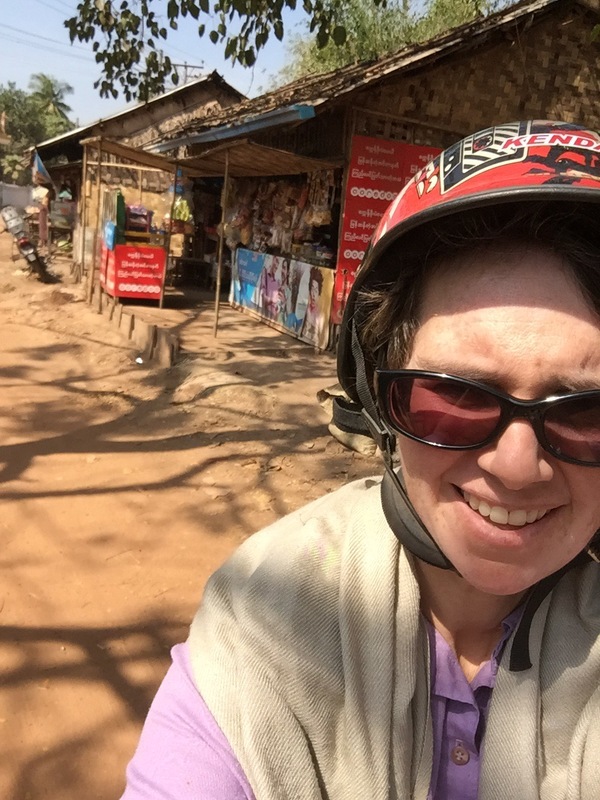 Fortunately, a motorbike guide talked me out of it. The temples are quite spread out and the streets are crowded with cars and motorbikes. I went with the guide. 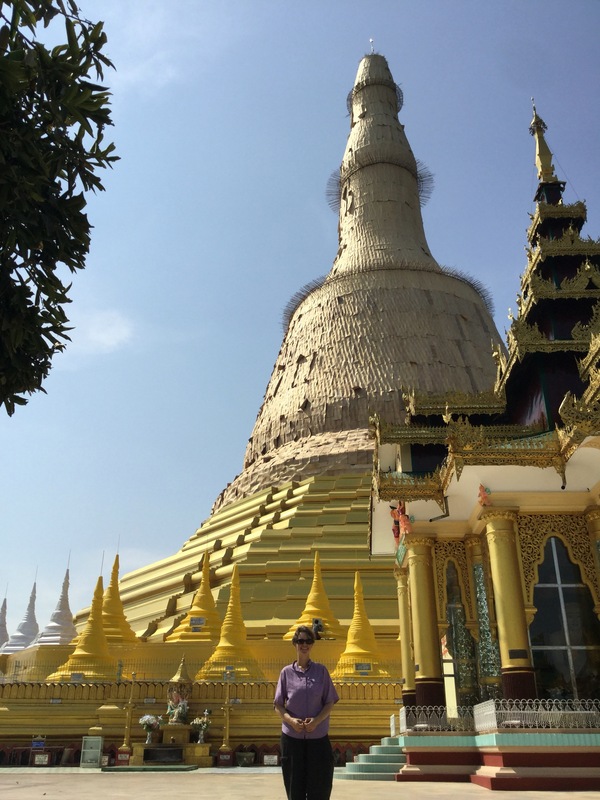 Our first stop was Shwemawdaw Paya, one of the tallest in the country. 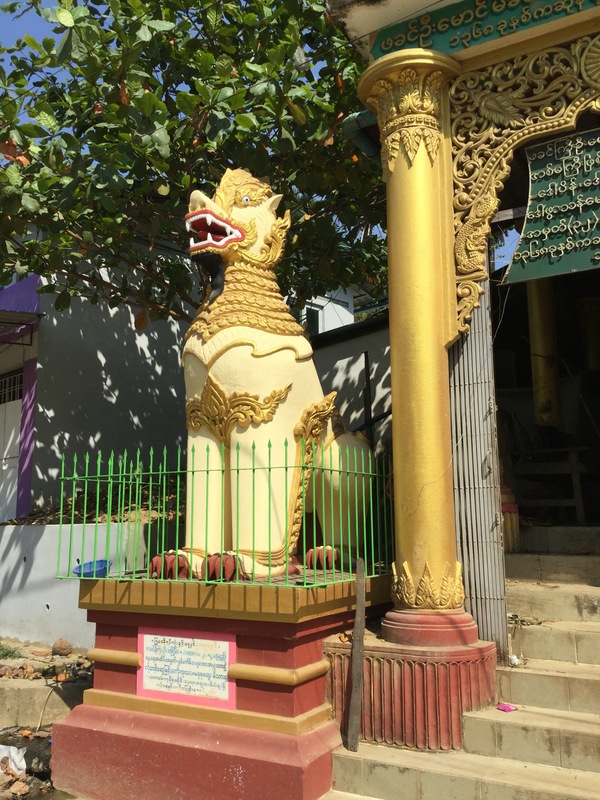 Next, I wanted to see the temple with the 127-year-old Burmese Python I had read about. 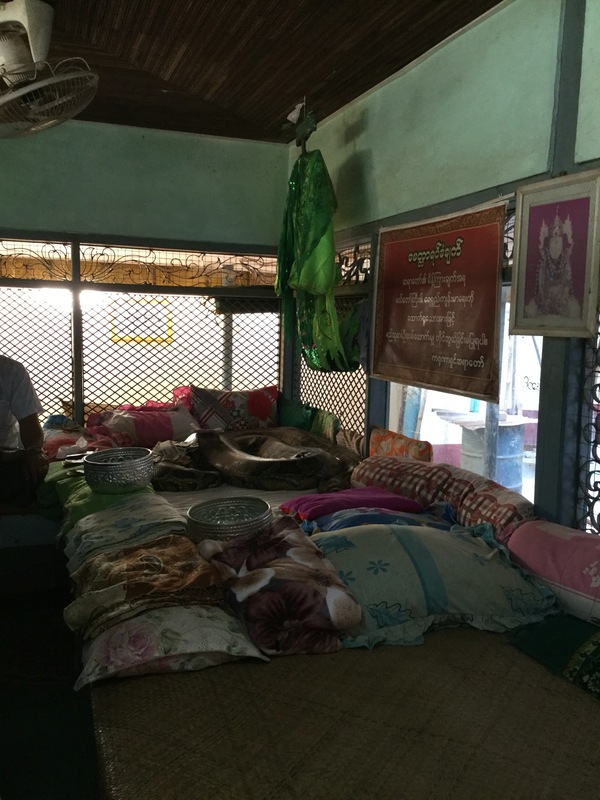 There he was in all his glory, surrounded by lavish pillows, many admirers and a monk. 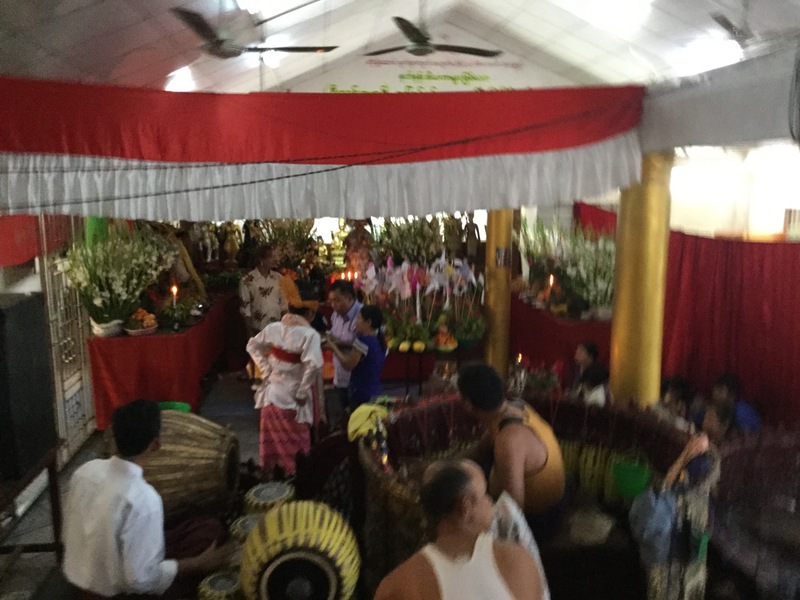 The next temple (can’t find name) was extraordinary for the ceremony that was taking place while I was there. Accompanied by singing and live music, people were offering plates of fruit to a dancer, who seemed to consider before accepting. 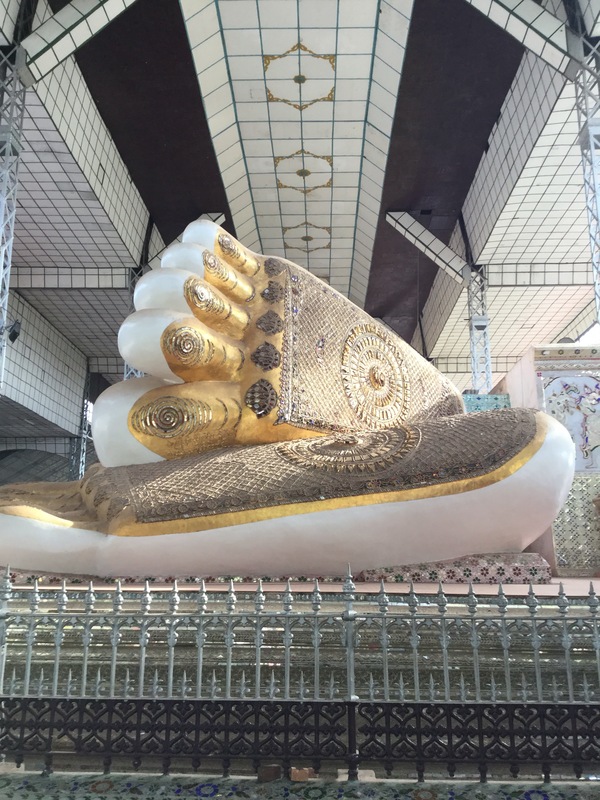 Someone explained to me that the offerings are for good luck. I was fascinated. The temple was lovely, too. 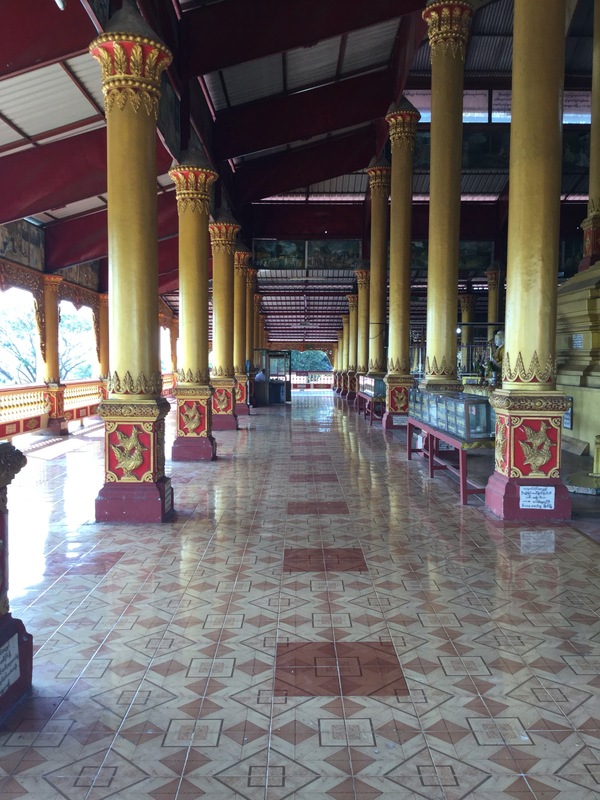 Bago had been the capital city four times in Myanmar history and houses a royal residence called Kanbawzathadi Palace. We went there next. There was a museum on the grounds. 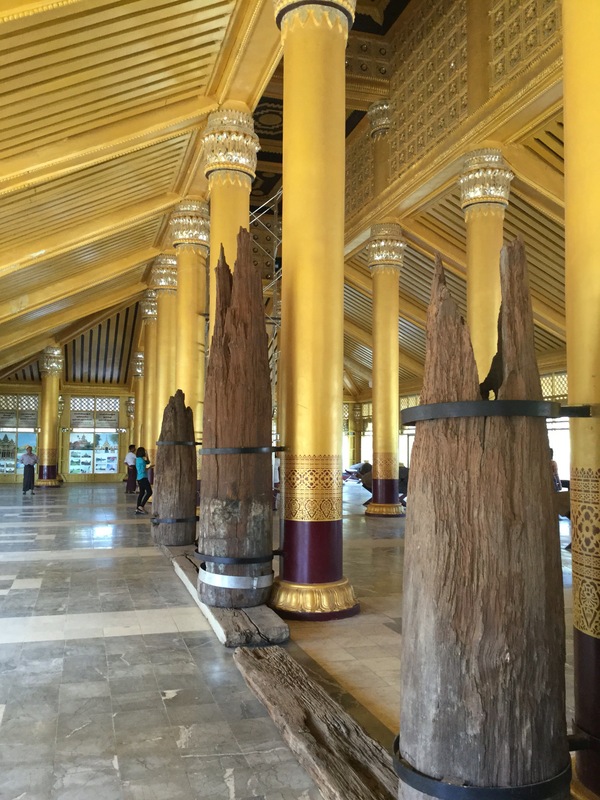 Original teak columns are displayed next to the restoration columns. 1. 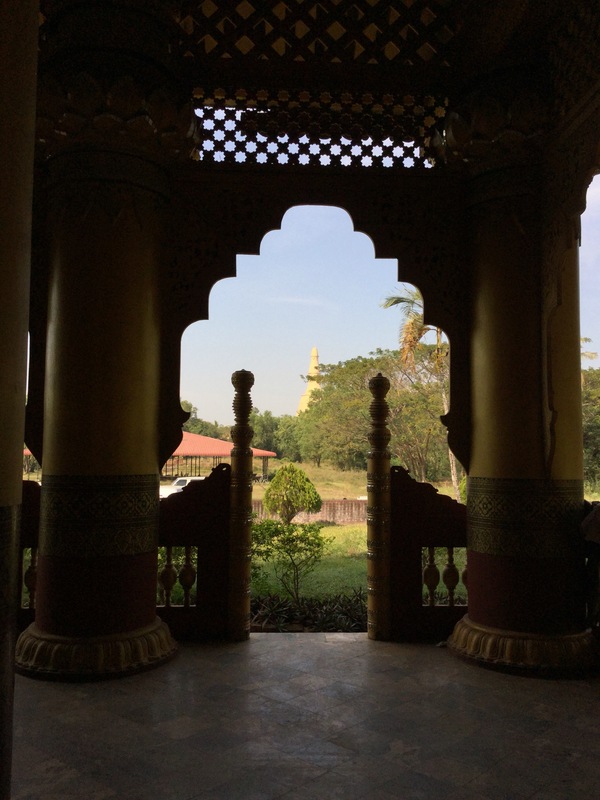 In Yangon, we applied for a special land-entry visa at the Indian embassy. We had help from a small storefront they recommended near the embassy because part of visa is done online and we needed it printed out, etc. It took about 4 days plus a weekend. $101 each. We were able to get a double entry, 90 day visa. It’s best to get longer than 30 days since the visa starts on day of issue. 2. 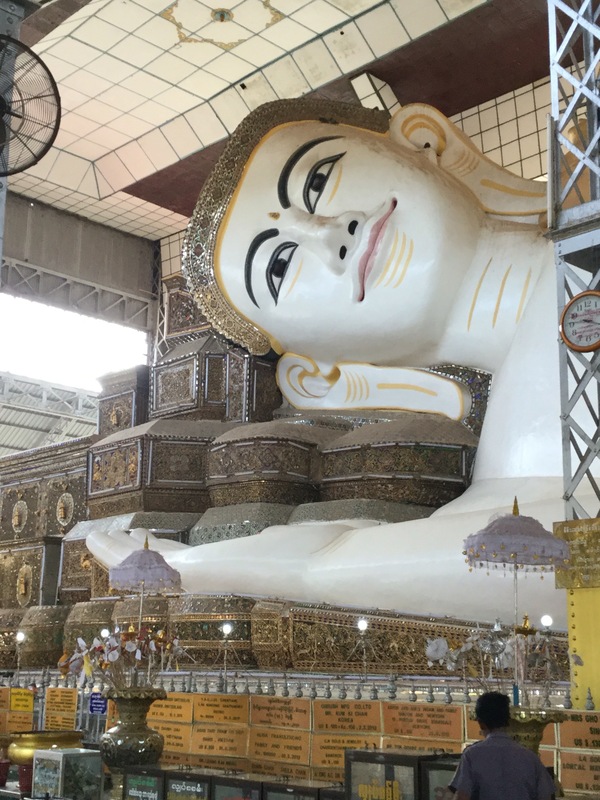 We applied for the special permit to enter Sagaing region of Myanmar. The country is still opening to tourists and some places are off limits, others are accessible, and some require a permit to enter. 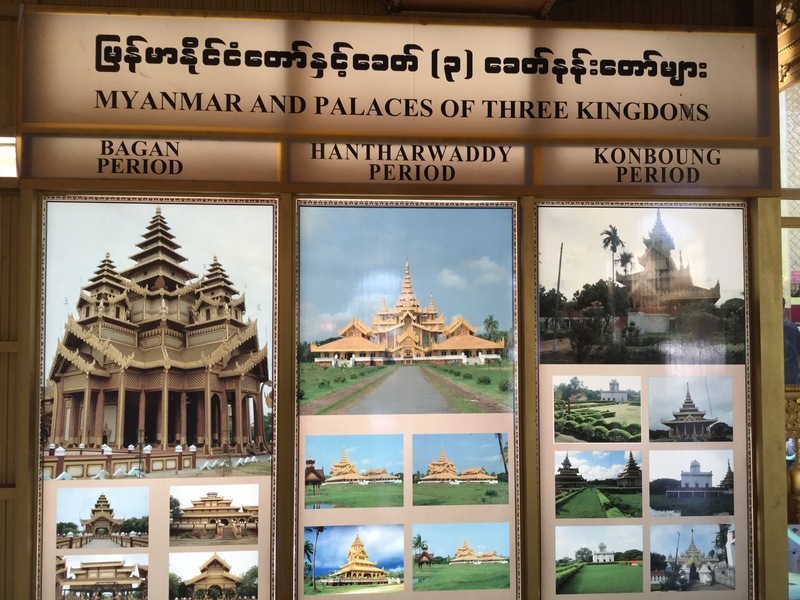 We went through the government agency of MTT (Myanmar Travel and Tourism). We paid a lot, at least for our budget- $80 each in cash, kids too- and received a handwritten receipt and a phone number for a man who was to meet us at the border. We had no permit in hand. This seemed unusual to us, sketchy even, but we went to another travel agency and both places had same price and plan. We had to specify a date to cross, and we were told we could cross up to 3 days earlier, but not after that date. We looked into flights, realized yet again we had more time than money, and we decided to give it a try. 3. 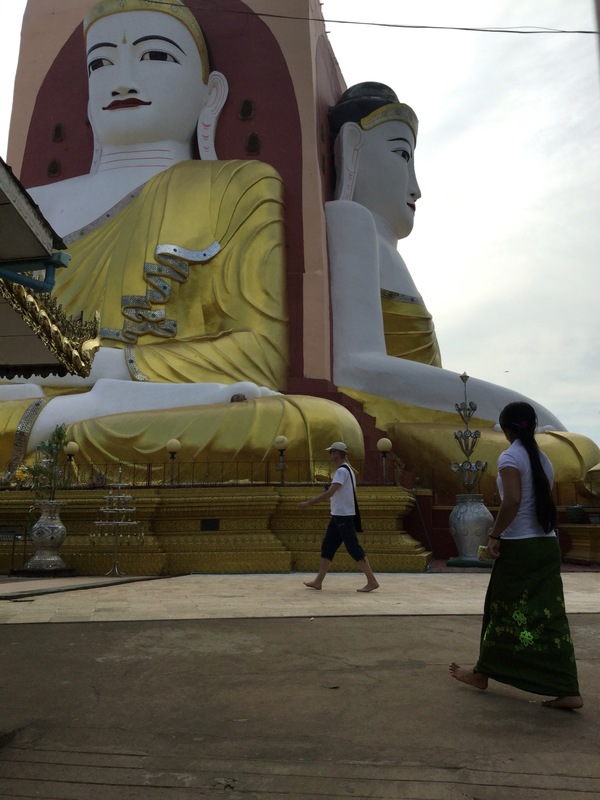 We travelled to Mandalay, then Monywa. We contacted the man who’s number we had been given. We told him our ETA. He said he was ready for us. 4. 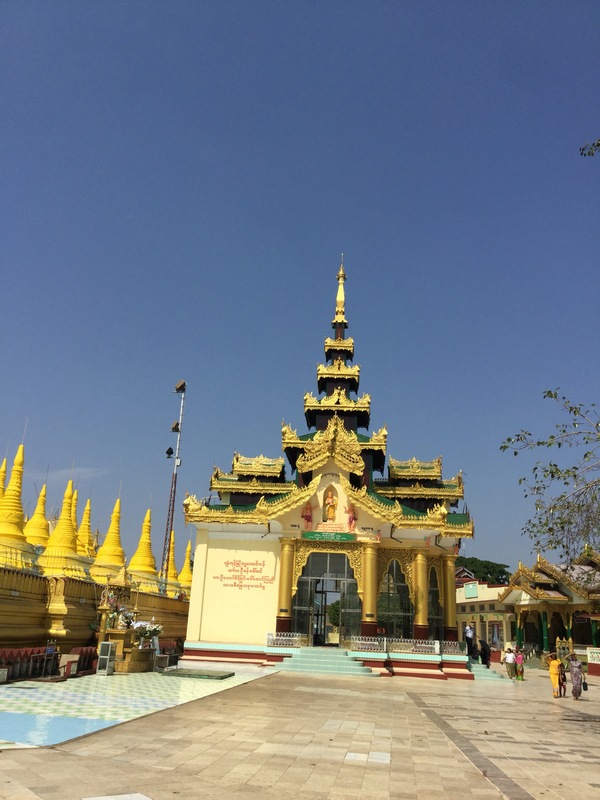 We took a night van from Monywa to Tamu, the border town. We did not need to show any special documents, which kind of surprised me since we were traveling through the restricted area. There was a checkpoint as we got into Tamu, and a guard seemed to check a list there. We did not show passports or our receipt when we bought the tickets or when we passed the checkpoint. BTW, our van broke down around dawn. The trip took about 18 hours. 5. We reached the immigration post at Tamu. This was an official building and they looked at all of our paperwork. We called our contact person, and he came. While the kids made drawings and took photos with some of the friendly young guards there, a more serious guard went through everything with our contact. We were asked for photocopies of our passports, which we hadn’t been told we needed and we did not have. This did not seem to hold up things. I kind of sweated this out, but things went smoothly and we were allowed to proceed. 6. 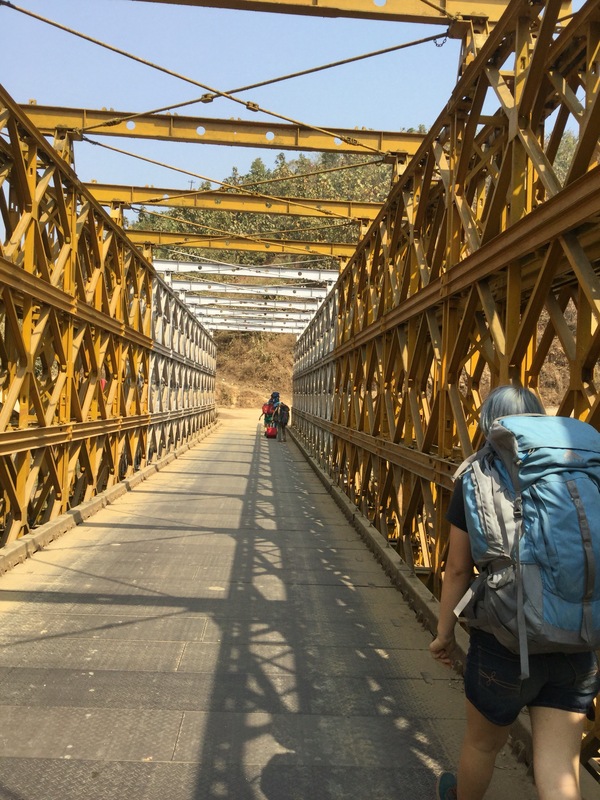 We walked across a bridge (yellow Myanmar, silver India! 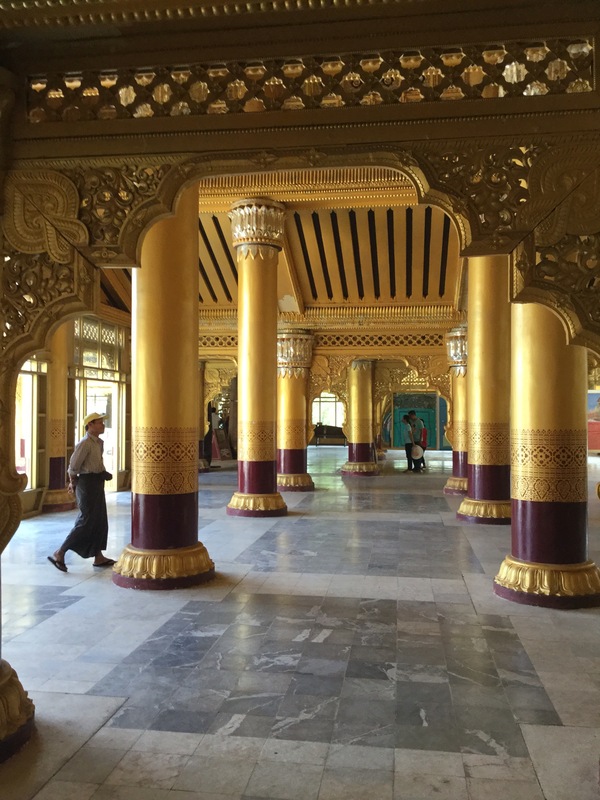 )and said goodbye to Myanmar. 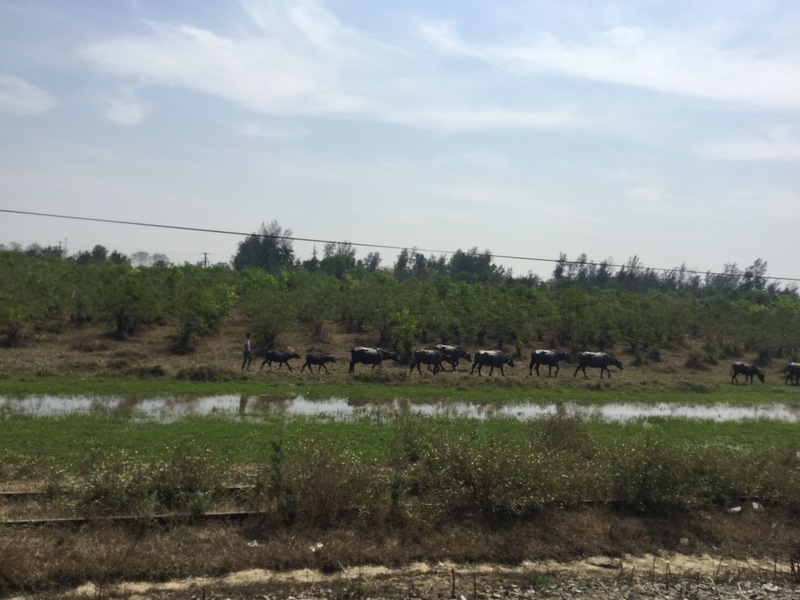 Then we were in Moreh, India but we weren’t done yet. We were happy but a bit worried about the next part. Our MTT contact said something about needing a permit on the Indian side, which we did not have. 7. Indian customs. Declaration forms x 6, uniformed soldiers with guns, a quiet beaurocratic outpost that doesn’t see much action, it seemed. They pointed up the road to where they said we had to go to a police station to get our passports stamped. 8. The six of us walked on the hot, dusty road and looked for the police station. We stopped at a checkpoint and they looked at our passports. They were young smiling soldiers who were sweet with the kids but also kind of worried the kids because they carried large rifles. We went on, passing several schools and even a fire station but no police station for a mile or more. We were sleep deprived and lugging all of our baggage. 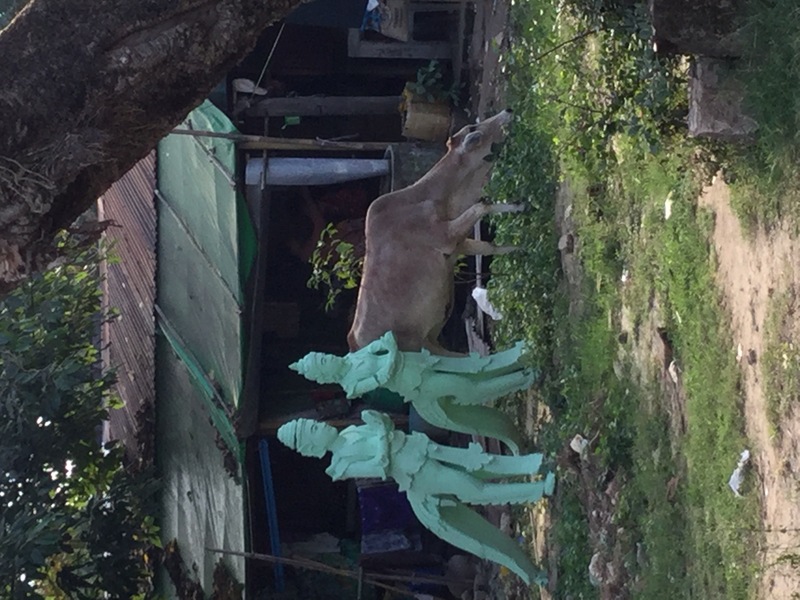 We realized we could not return to Myanmar if this didn’t work out. This was not a pleasant thought. 9. Police station. An unimpressive building up a small hill of a driveway. We sweated our way up to an open-air pavilion surrounded by chickens. We filled out more forms and finally got the visa stamps. They did not ask for a permit, whew. We were in! 10. There are guesthouses on Moreh but we decided to push on. We negotiated a private taxi to Imphal right there at the police station. Several drivers said there are no busses, and that it costs 500 rupees per person for the 3 hour drive. We rejected one pushy driver with a vehicle that looked too small. We went with a driver for 2500 rupees. Leaving Moreh, there were at least three checkpoints. They went through our paperwork and luggage, but still smiled and chatted a little. We unpacked and repacked the car. We admired the amazing mountains around us and felt the cool mountain breezes as we waited to get through the checkpoints. Several more checkpoints were left, but we didn’t have to unpack the car again. 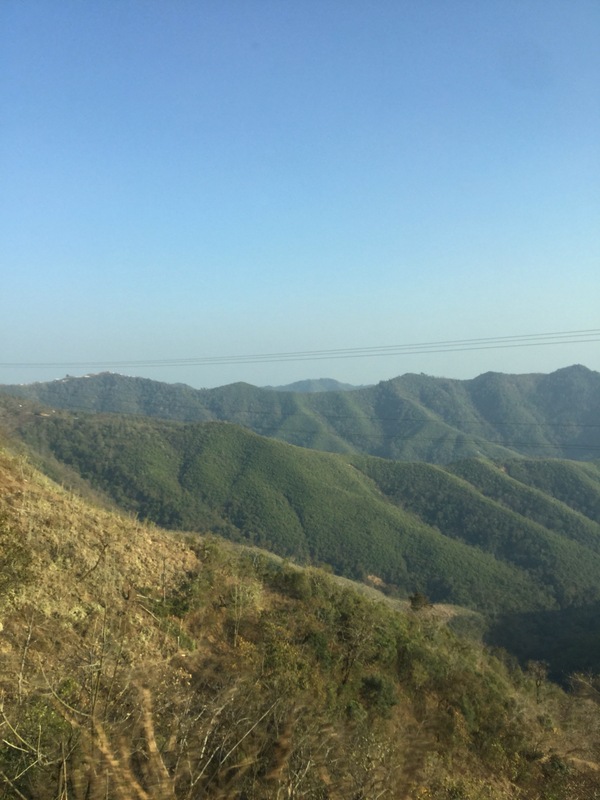 The ride to Imphal was a roller coaster of sharp turns and steep hills. And that’s how we did it! Looking back, it was a little crazy but we were lucky and it worked out. I understand, though, that things change and this plan may no longer be valid. Look into more current tales of this unpredictable border crossing. Good luck travelers! Fifteen hours on a bouncing wooden bench. Overnight. Why did we do this to ourselves? I’m still not sure! 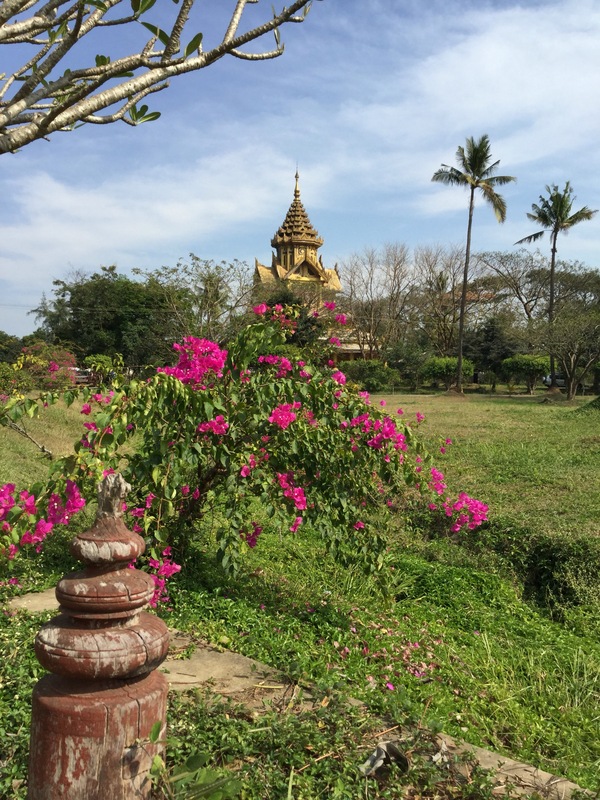 We logistically could leave Yangon. We had our expensive land-entry Indian visas in hand. 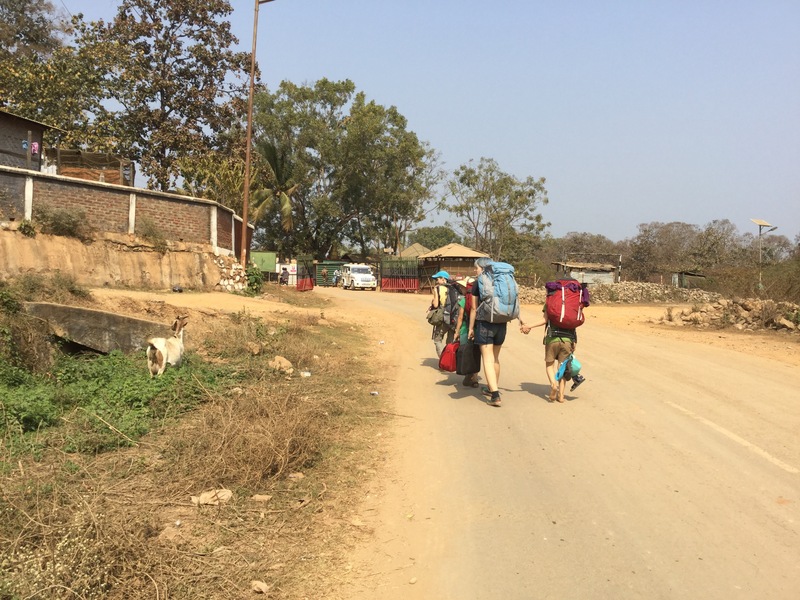 We had paid and registered, and we had contact information for the Myanmar permit to enter the restricted area at the Indian border. We had stayed an extra night due to popular demand by the 15-and-unders. We were ready to get ourselves to Mandalay in the north. We had considered and rejected going first to Bagan (unpopular with the temple-fatigued troops) and/or Inle Lake (night bus arrives between midnight and 3 am, also unacceptable to the majority )- two popular tourist destinations that sound pretty good, sigh, but such is the nature of extended family travel. 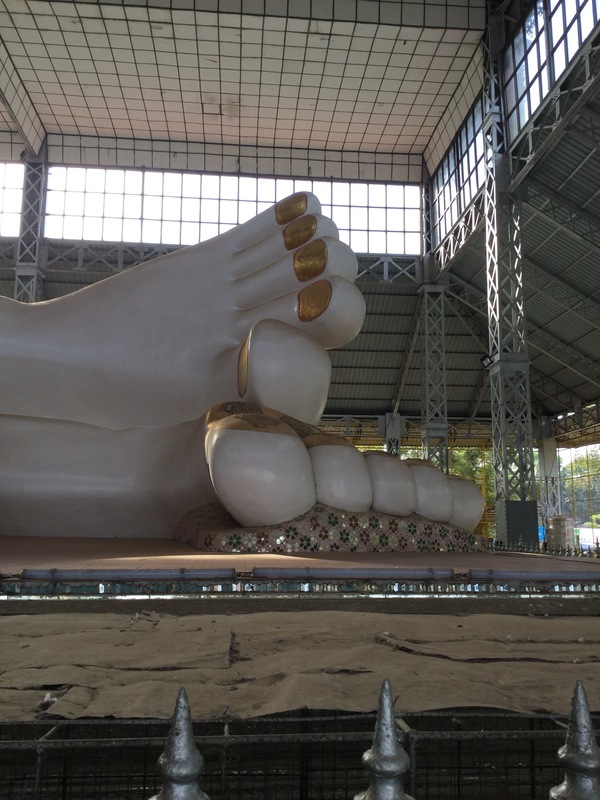 So the decision was how to get to Mandalay. We spoke with several bus companies, and it was confusing. They seem to be run from a card table on a dusty street, sometimes just from a random guy with a cell phone, and prices varied widely. Our hotels also sold tickets, but offered fewer options. The bus station, as we knew from when we had arrived in Yangon, was 1-2 hours away through menacing traffic by $10-15 taxi one way, so going there to find prices and times would be time-consuming and expensive at best. Meanwhile, the train station was a walkable distance from our hotel, was better established, and offers the romance of antique British rail and rural views. 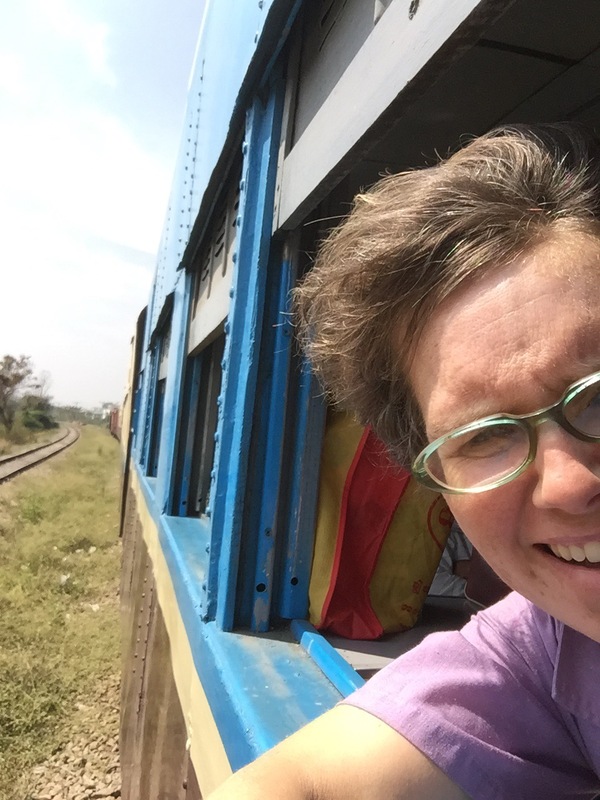 We had enjoyed the trains in China and Thailand, and we liked what we read on seat61, so we decided to go by train. Only, hold up-the sleeper cars were sold out! 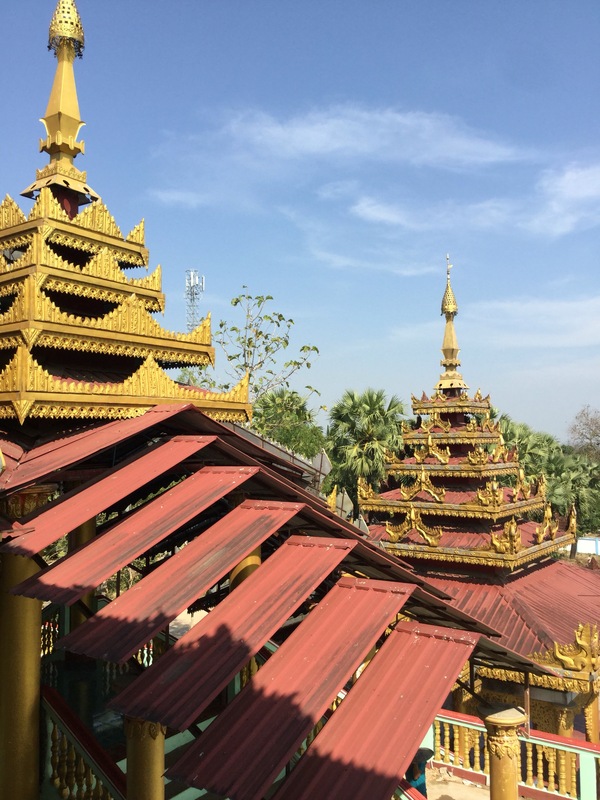 We could wait 3 days, but we had been so long in Yangon and we had no hotel booked, which had proved problematic a few days prior. How about upper class, with padded reclining seats? Sold out. What’s left? ‘Ordinary class’ wooden benches, a bargain at $4 each, yes, but should we? We did. And the troops wailed and moaned and gritted their teeth. But we had made our choice, and we figured how bad could it be? It really wasn’t horrible, despite a detailed list created by one of my offspring to express otherwise. Our assigned car was almost full, so we did not have the option of sprawling across the whole two-person bench. We were surrounded by locals readying themselves for the same trip, and we watched and learned. We ended up, like many passengers, making a small bed on the floor between the pair of benches facing eachother. One could stretch one’s legs out a bit this way under the benches. I slept this way on the shaking wooden floor, and I may have fallen asleep once or twice. 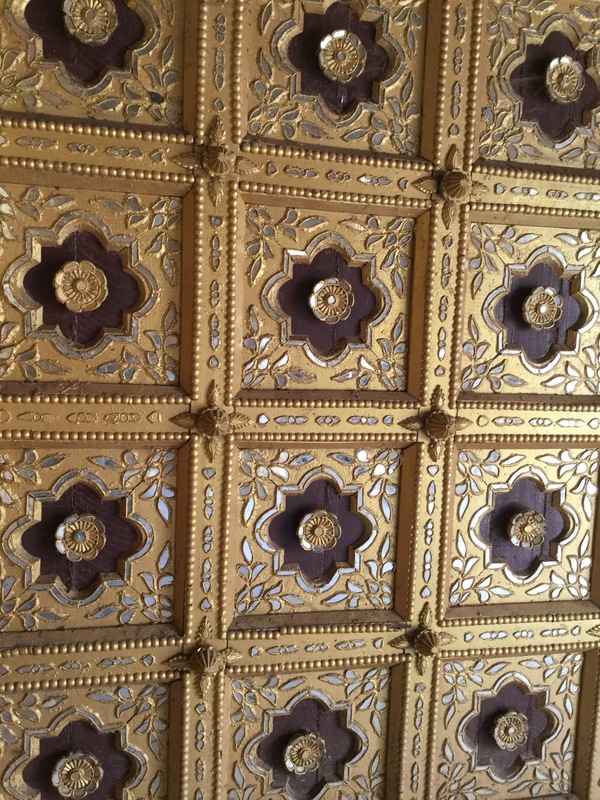 I liked the swaying, bobbing train and I liked how I could glimpse the swiftly moving tracks inches from my head as I peeked between the floorboards. It was a long night as the train cars jostled about, the fluorescent lights shone brightly, the wheels clacked in varying rhythms and occasionally shrieked or made a mighty CLANG!, and the vendors shouted about their wares even in the small hours. Near sunrise, 6am, people started moving around and sliding open the vented aluminum windows to the fresh air. We could watch the sun rising and again see the rice fields that seemed to extend to the horizon. We had made it through the night and we congratulated ourselves. The twins actually seemed to have slept ok. We eventually pulled into the Mandalay station, caught a taxi to a hotel and decided it was fine. Next was food, naps, and showers, and we were back in the swing of things. 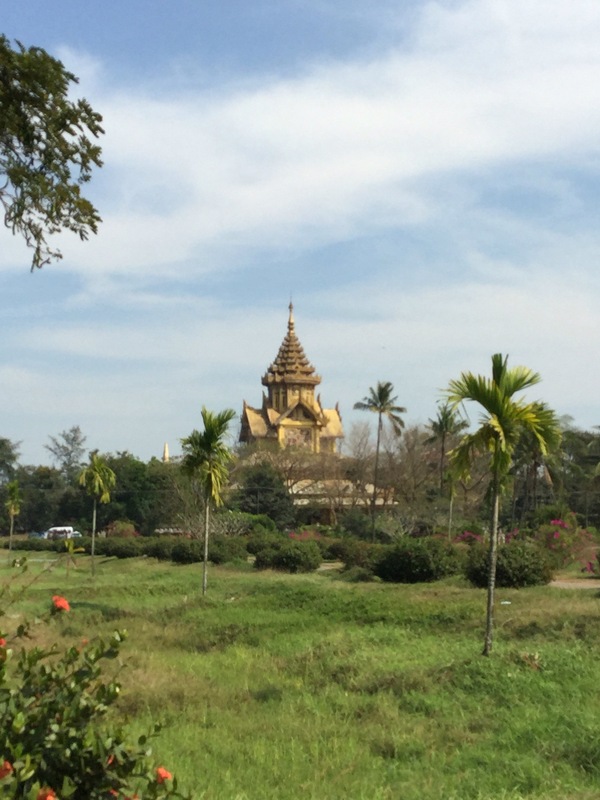 Hello, Mandalay!